In second grade all the kids on my block got around on bicycles. You had to have one to be in the secret club that had a private hailing signal, which we yelled out across the streets. If there was an echoing answer, it meant another club member was outside somewhere and we would be able to find each other by following the ever increasing Doppler intensity of our squawks. 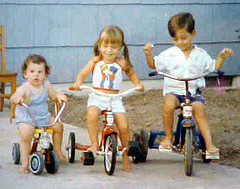 There was also a law in White Plains (NY) that all children had to have a bicycle license. It was a small metal disc that was attached to the front wheel under the tire bolt. Bicycles had to have a safety inspection and children had to pass a safety course, both of which took place once a year at the elementary school. Since my birthday was in December, my physical development was, at a maximum, one year behind the January students in my class. As a result I needed a shorter and smaller bicycle than the standard one. I got a beautiful shiny red two-wheeled bike for Christmas and could not wait until spring when it would be inspected so that I could ride in the pack with my friends. When the eagerly anticipated day came, I took my bicycle to the inspection stand, but the person in charge told my mother that the bike was not officially tall enough and therefore did not qualify to be licensed. The man was stoically inflexible about not bending any Rules of Local Cycling even though it would help a little boy who desperately needed his official wheels. My mother angrily argued with him, but to no avail. She said it could not possibly make that much difference since a bicycle was after all, a bicycle. Then when she asked him where I was supposed to ride it, he said he didn’t know as long as it was not out in public. Now there was a truly enlightened response. I guess I was supposed to ride it in my bedroom. All the other kids laughed and made fun of my mini-bike as we packed it in the car and I went home crying at having been both rejected for a license as well as being disgraced in public. But worst of all, now I had lost my wheels. For a short time I was devastated, but managed to bounce back fairly quickly. Because there wasn’t any logic to the rule anyway, I decided to furtively ride my unlicensed bike around the nearby blocks, sometimes hiding behind trees or bushes, always on the lookout for the police who never seemed to show up or to even to care very much as they whizzed past in their patrol cars. Probably having bigger fish to fry than a seven year old unregistered bicycling scofflaw, I never did get busted and rode around for the next year on my two-wheeled ‘not really a bicycle’ until I grew big enough and tall enough to fit into a standard sized officially legal velocipede which then had an officially proper license. Aside from being a public embarrassment, this encounter was also my first frustrating experience with a bureaucracy of any kind along with its typical immutable characteristics: inflexible, insensitive, lacking compassion, uncompromising, rule bound and rigid. Unfortunately, it would not be the last such encounter for me, as later in life I was obliged to add many more to the list: Usually all laced with incompetence and definitively lacking initiative. Although I do not usually advocate breaking rules, I repeatedly discovered over a long period of time that there exist a significant number of ridiculous prohibitions that completely defy common logic. Beginning in my childhood and continuously escalating over decades, it seems that America has become a nation, which feels compelled to legislate for every social flaw or every social conflict; otherwise known as the phenomenon of creeping paralytic Socialism. No explanation needed then for why the Hell’s Angels went completely around the bend. Big men on big bikes flipping their middle fingers at the norms and values of over restrained regimentation. I just want to ride my motorcycle. I just want to ride my motor-cye.